FINALS NIGHT TONIGHT! ARE YOU READY? 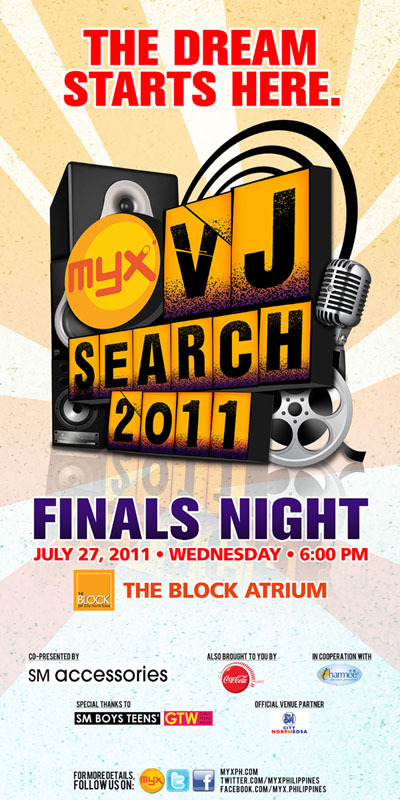 Watch the Finals Night of MYX VJ Search 2011. Its at SM THE BLOCK ATRIUM and starts at 6:00 PM. You can watch MYX at SkyCable Channel 23. Also, check out and log-on to www.myxph.com and also join MYX Phlippines Fanpage on Facebook. Tune in and find out who will be the new VJ MYX this 2011! See you there at SM THE BLOCK ATRIUM! VJ MYX 2011 is co-presented by SM ACCESSORIES. Follow SM Accessories on Twitter and SM Accessories on Facebook for more promos and info on what's latest in Accessories. So Coffeeholics, whose your bet? Its sooo hard to choose! Let me know who you think will win!